The growing concern over easy acquired infection; bacteria and viruses and fungus can be carried from person to person on the surface of any equipment and products unless it is decontaminated between use. Sterilisation and disinfection reduces the risks of cross infection, the process by which microbes are passed from one infected person, to cause infection in another. Ultraviolet light has been used as a sufficient method of killing bacteria and sterlising equipment & surfaces for an array of medical and professional environments. It is a simple to use toxin free method. © 2012 Helmut Kaiser Consultancy. All rights reserved. compact size disinfection light that uses Nano-UV light to sterilize surfaces, crockery and cutlery in seconds. Kills 99.99% of bacteria, virus and fungus with 10 seconds. Sterilizes in seconds to protect you and your family from unclean situations. Kitchen and bathroom surfaces, door handles and cupboards, mattresses and cribs – how about your family’s phone or computer keyboard? 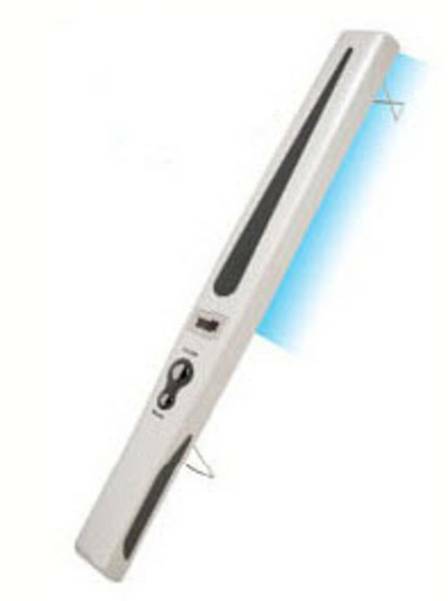 Once you begin killing germs (in just 10 seconds) with the Nano UV Wand, you could keep going and going. Safely kills 99.99% of all surface bacteria and viruses within 10 seconds using the UV power of light. Also eliminates, lice, fleas and dust mites. Laboratory certified tested and FDA listed product. The large 13” wide coverage is one of the largest on the market, enabling you to sweep large areas quickly and effortlessly!